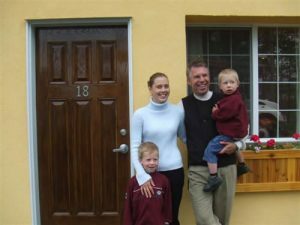 The first of three new buildings starts the transformation to Elizabeth Lake Lodge. 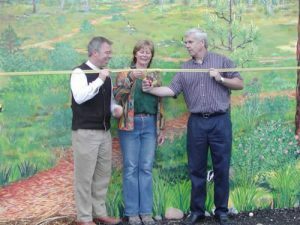 Phase 1 opened in June 2007 with Mayor Ross Priest (right) and owner George Freitag (left) were present for the Ribbon cutting. 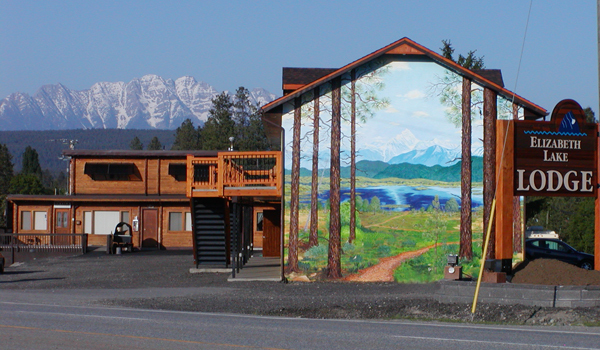 Cristine Macdonald's (center) mural is on the West wall of Elizabeth Lake Lodge, and is visible coming into town from Creston to the west. 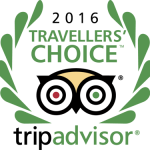 The new addition brings larger rooms, full kitchens, flat screen televisions and comfort features such as heated tile in the bathrooms. 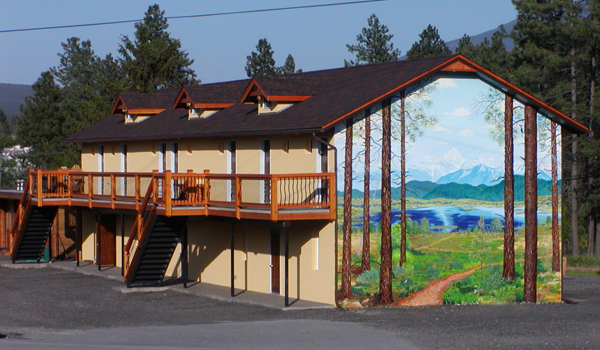 All the rooms face the Elizabeth Lake bird sanctuary and the trails start right outside your door. George and Rachel's standards for cleanliness and customer service continue today, with the same passion as when they opened in 2007. Phase 1 is complete and the Mural on the new building is the gateway to Cranbrook. The original office can be seen the background below the Steeples of the Canadian Rockies. The office will not be upgraded for several years, the inside of the office is the only place you can see the Pan Abode construction that made up the original Ponderosa Motel.